Gaia bed linens are relaxed and refined and are made with an Italian cotton percale with subtle tonal striations for a classic, contemporary look. Solid white Perla fabric is offset with a single wide border in the color of your choice. The collection is paired with Home Treasures' Savannah coverlet. Gaia bed linens are relaxed and refined and are made with an Italian cotton percale with subtle tonal striations for a classic, contemporary look. Solid white Perla fabric is offset with a single wide border in the color of your choice. 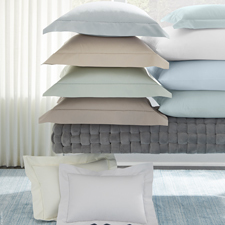 The collection is paired with Home Treasures' Savannah coverlet. 100% Italian cotton percale Duvet Cover: 3-inch Gaia border along the edge; 2-inch Gaia border as U-shape inset Sham: allover Gaia; plain hem finish Flat Sheet: 2-inch Gaia border along Euro return Fitted Sheet: solid white Perla Made in the U.S.A. of Italian fabric Machine wash. See product label for exact care instructions.